Preheat oven to 350° F. Prepare a 9x13 cake pan with non-stick cooking spray. Prepare cake mix according to the package directions (using egg whites to make the cake as white as possible). Bake as directed, removing from oven when a toothpick inserted into the center comes out clean and the cake springs back to the touch. Allow to cool completely, then cut the cake into 12 big pieces. For perfectly white cake pops inside, skim off the golden tops and bottoms of the cake pieces with a sharp knife. Finely crumble the remaining white cake into a large bowl. Roll cake mixture into 48 balls, each about 1-1/2 inch in diameter. Place balls on a wax-paper-lined tray or baking sheet. Cover loosely with plastic wrap and allow to cool in the refrigerator for an hour. Holding the end of each stick, dip the cake ball quickly and completely into the melted candy. Tap the stick gently on the side of the pan or bowl to allow excess candy to drip off. Quickly sprinkle with decorations, if desired, then poke the end of the stick into the styrofoam block and allow the cake pop to set up upright until hard. 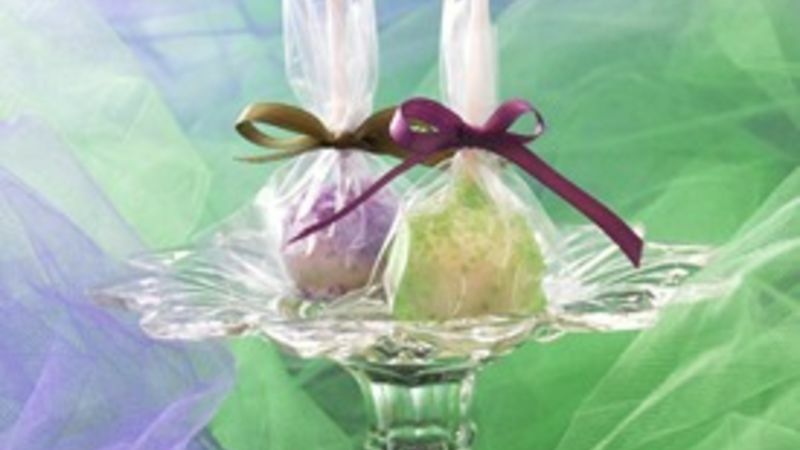 When the cake pops are completely set and dry, place them in small plastic candy bags and tie with ribbon or beads.